FALLS CHURCH, Va. (March 27, 2017) – Grinding away at the job hunt does not always have to be a daunting task. Sometimes it can be as comfortable as lunch with friends. 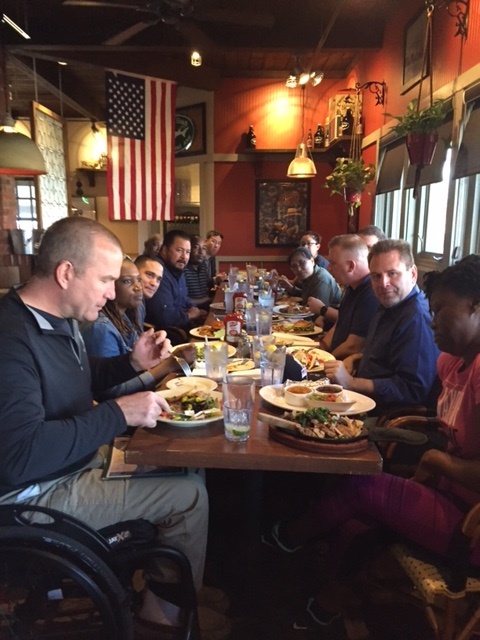 Wounded Warrior Project® (WWP) veterans recently gathered in Falls Church and discussed the benefits of WWP’s career counseling program. While learning about successful tools to take into the civilian career world, injured veterans experienced what is possible at social events that get them connected with their service brothers and sisters and committed to their healthy transitions to civilian life. Veterans and guests learned about the valuable resources available to them through the veteran employment program. Services include job placement, resume assistance, interview coaching, and professional networking. In addition to helping veterans map a career blueprint with attainable goals, career counseling staff can show them how to effectively highlight their military experience. Hiring veterans in the civilian workforce gives organizations highly coachable team players with specialized skill sets, who are an asset to any team. WWP’s career counseling is more than just a source of manpower for organizations that want to enhance their teams with veterans. It educates potential employers about combat-related injuries and reasonable accommodations. This is key for developing a long-lasting relationship throughout employment. The program creates a bridge of understanding between veterans seeking a foothold in the civilian working world and organizations looking to employ those instilled with the work ethic and sense of duty the military provides. Yong said she felt a certain level of apprehension because she did not know anyone. With WWP events specially tailored to accommodate physical injuries and social anxieties, that feeling did not last long. In addition to career counseling, staff members advised warriors of additional services to assist in their recovery processes. Thanks to generous donors, WWP programs and services are offered free of charge to warriors, their caregivers, and families, and they assist with mental health, physical health and wellness, career and benefits counseling, connecting warriors with one another and their communities, and long-term care for the most seriously wounded. Kenneth said he encourages his fellow veterans to reach out to WWP if they have not done so already. Warriors can access beneficial career counseling guides online, including financial planning assistance and tips on managing expectations when attending civilian job fairs. When a warrior connects with a program specialist, more in-depth help is available.